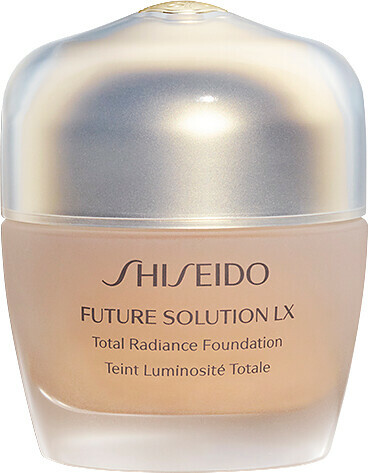 Enhance the radiance and youthfulness of your complexion with the Shiseido Future Solution LX Total Radiance Foundation, an age-defying makeup base that enriches skin with skin-smoothing ingredients. The Shiseido Future Solution LX Total Radiance Foundation is a velvety smooth foundation that diffuses the appearance of fine lines, dark spots and pores with its full coverage formula and luminous finish. The combination of Time Match Powder, Photochromatic Powder, and Micro Fit Technology respond to changes in your skin, creating a beautiful complexion and canvas over time. Designed to reveal a softer and firmer look to your skin, the Future Solution LX Total Radiance Foundation is infused with an exclusive SkingenecellEnmei Complex to add resilience back to your skin and prolonging its vitality. In addition, 4MSK and aura radiance technology enhance your skin’s overall glow, whilst Japanese botanicals Uji green tea extract, Oshima sakura leaf extract and Hokkaido angelica root protect, repair and promote the health of your skin, day after day. Apply a pearl-sized amount to your fingertips and smooth over your face.